"A story about the collision of the Old and New West." CBS Films has debuted a trailer for the drama Hell or High Water, the latest film from David Mackenzie (who last made one of my favorites - Starred Up). Hell or High Water is premiering at the Cannes Film Festival this week, and will be out in US theaters in just a few months. Ben Foster and Chris Pine star as two brothers who come together to rob a bank, but end up on the run being chased by Jeff Bridges as a relentless Texas Ranger. This definitely has the vibe of a western with some contemporary sensibilities. The full cast includes Katy Mixon, Kevin Rankin, Dale Dickey, Gil Birmingham, Marin Ireland and Melanie Papalia. This looks like solid - give it a watch. 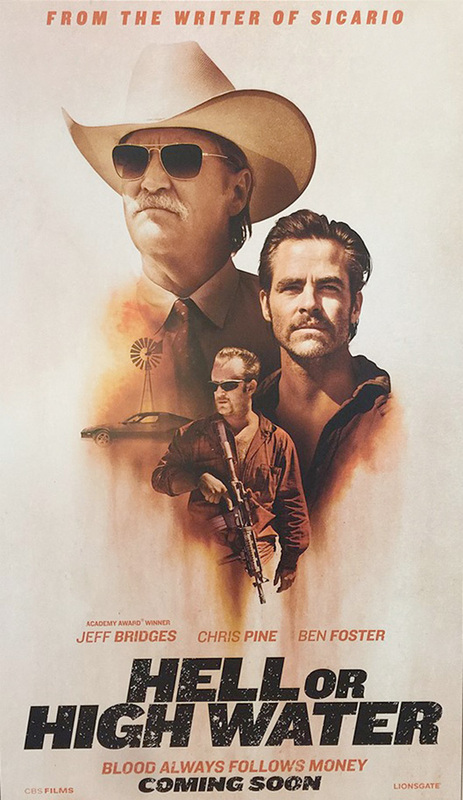 Two brothers—Toby (Chris Pine), a straight-living, divorced father trying to make a better life for his son; and Tanner (Ben Foster), a short-tempered ex-con with a loose trigger finger—come together to rob branch after branch of the bank that is foreclosing on their family land. The hold-ups are part of a last-ditch scheme to take back a future that powerful forces beyond their control have stolen from under their feet. Vengeance seems to be theirs until they find themselves in the crosshairs of a relentless, foul-mouthed Texas Ranger (Jeff Bridges) looking for one last triumph on the eve of his retirement. As the brothers plot a final bank heist to complete their plan, a showdown looms at the crossroads where the last honest law man and a pair of brothers with nothing to live for except family collide. Hell or High Water is directed by David Mackenzie (of Starred Up, Perfect Sense and Hallam Foe previously) from a screenplay written by Taylor Sheridan. CBS Films will release the film in theaters starting August 12th this summer. Jeff Bridges ? I'm in. I can stare to his face for two hours. It looks like Chris Pine is trying to catch a train with good guys. Oh, I haven't seen Jeff Bridges for some time, I have a feeling I won't regret seeing him again, right? Modern Western??? Yes, please. // It will probably pale in comparison with NO COUNTRY FOR OLD MEN, but I will gladly take another cowboy Jeff Bridges. I do enjoy me some western style rooting tooting shooting.